Providing quick and easy access to tape, this dispenser is suitable for use with rolls of tape measuring 33m or 66m long and 25mm wide. 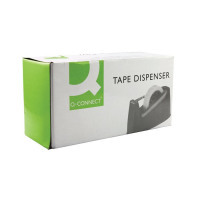 Ideal for the home or office, this black tape dispenser has a durable plastic construction and a non-slip base for desktop use. UNA HAND | VERY CHEAP!